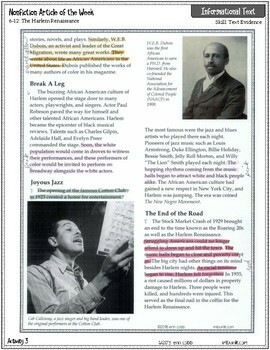 Review reading informational text standards RI.6.4 (Analyze Technical & Connotative Meanings), RI.6.5 (Analyze Text Structure and Text Features), and RI.6.6 (Analyze Author's Point of View and Purpose) with this high-interest article on the Harlem Renaissance and its significance to American history. Students will also complete activities for text evidence, integrating information, literal comprehension, and take a comprehensive assessment. 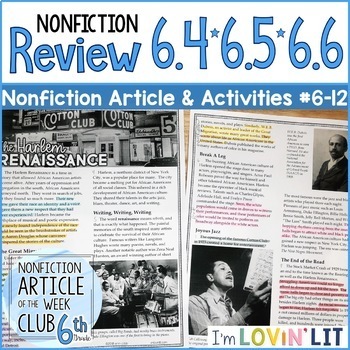 This is the twelfth in a set of 25 informational text articles + activity packs designed to teach ALL of the reading informational text standards for 6th grade in a fun, rigorous, and easy to implement solution! 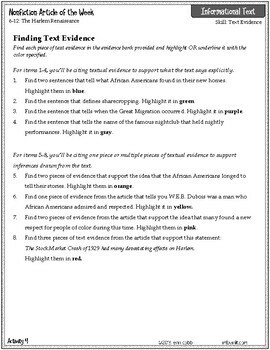 The focus in this resource is on teaching students to analyze text structure, including text features, in a nonfiction text. In addition, because this is a review pack, Activity 5 is longer than usual and the test is 12 questions instead of 8 (10 multiple choice and 2 open ended/discussion). You can also check out this blog post to find out more about the series. 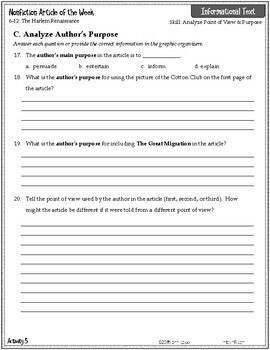 Save and purchase the Article of the Week, Grade 6 bundle here!